If everyone does a little, a lot of people benefit. Help us help those most in need and feel Fabulous today! If you would like to” pay it forward” and have one of your items be consigned under one of these worthy causes, please let the intake specialist know your wishes. They certainly appreciate all the help they can get! We also support Longmont Gives a local organization supporting human service nonprofits in the St. Vrain Valley. When someone consigns their items under this account, 40% of the sale proceeds go to Longmont Gives Community Fund and is distributed to local charities. Organizations served by LGCF have included Safe Shelter, The Inn Between, H.O.P.E., A Woman’s Work, L.E.V.I., Education Foundation of St Vrain Valley, OUR Center and more. The Mission for the Women’s Foundation of Colorado is: To build resources and lead change so that every woman and girl in Colorado achieves her full potential. 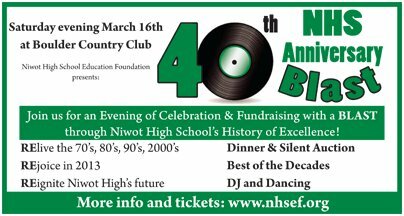 Sponsored the Niwot HS Education Foundation to help Niwot High School promote the welfare of students, graduates, and staff members by providing financial support for the programs that will enhance and enrich student learning.